‘Ghosthunting Texas’ Book Release Party! April Slaughter and The Paranormal Source, Inc. 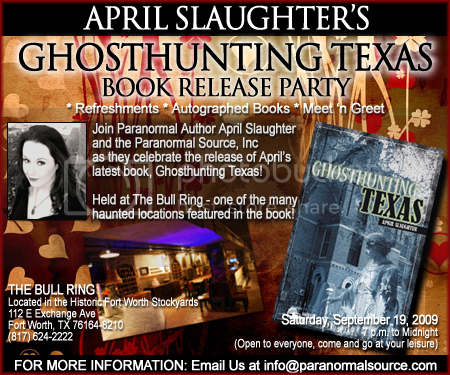 Team would like to personally invite you to the official book release party for Ghosthunting Texas! Come and meet April, buy a copy of her book (which she will gladly sign), and meet other investigators and researchers actively working in this great state. The Bull Ring is one of the haunted locations April has profiled in the book, and they have graciously offered to host the evening. The Paranormal Source team will be showcasing their collection of the latest in ‘ghost box tech’ including two original Frank’s Boxes built by Frank Sumption and the MiniBox Medium Prototype built by Ron Ricketts of Paranormal Systems. Personal merchandise and fundraising items will also be available during the evening. While no reservation is required to attend this event, please leave a comment or send us a note to let us know you’re coming! Many Thanks to FUNimation Entertainment! The Paranormal Source, Inc. team would like to publicly thank FUNimation Entertainment for their recent product donation to assist us with our fundraising efforts! We are extremely grateful for their support and look forward to future collaborations. Based in Texas, FUNimation is a leader in the Anime industry, and we are working on some exciting cross-promotions! Be sure to visit our ‘Store’ section for the latest additions in FUNimation products. You are currently browsing the Paranormal Source - Paranormal Research & Development Team blog archives for August, 2009.